Asset IDs help IT Administrators track property among disparate systems. Watchman Monitoring supports an Asset ID field on computer records as well. When viewing a Computer Record, use the Edit tab to reveal the Asset ID entry box. Asset IDs entered here will show on the information pane of the Computer Record. Asset ID information can also be used in the omni-search box at the top of the Dashboard. 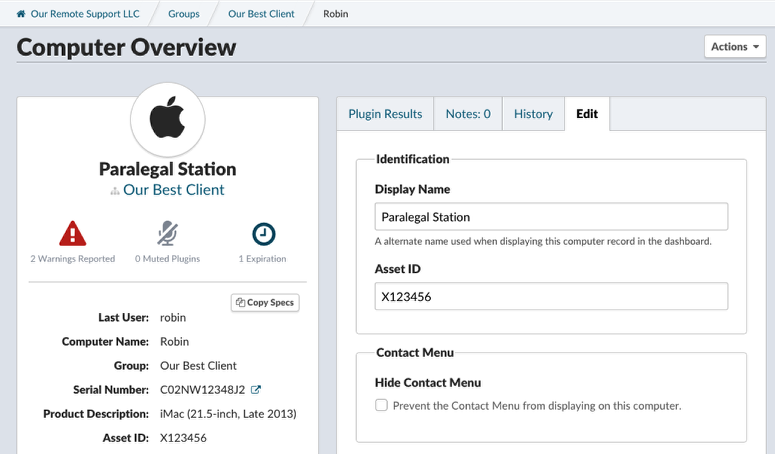 As of Mac Agent 6.4.3, the Asset ID information can be read locally. Setting this on the local computer is not supported, and will be overwritten at this time.